Shared Egg is an interesting project that attempts to visualize the connection points between friends. 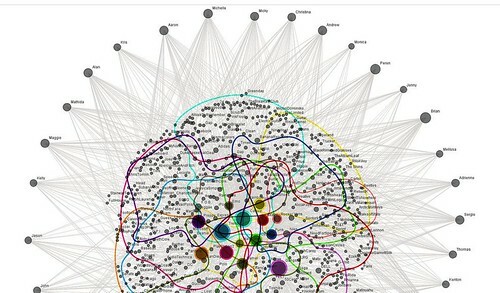 It maps the common areas that bring people together using a combination of interests and brands. It illustrates that brands can be the connective tissue between people; people share a love of brands and an have affinity for them. Here’s an isolated look at the Nike relationships within the map…. It raises some interesting questions..
1. How do brands connect to bigger themes, interests, ideas and emotions? 2. How are brands leveraging those connections? 3. How do brands enhance those connections? 4. How do brands bring communities together? While many have questioned the role of brands in social networks and communities, Shared Egg illustrates that people can be connected and linked by brands. It still remains to be seen how brands best leverage this opportunity to activate and build out these connections and these communities.